A product of small town America, Graham, North Carolina, Robyn S. Hadley was educated in the public schools of Alamance County and went on to receive a Morehead Scholarship to The University of North Carolina at Chapel Hill and a Rhodes Scholarship to Oxford University in 1985. Since college, Hadley has helped teenagers and parents understand how to prepare for college and pay for it. Her work in this area had been mostly as a volunteer until 2004 when she made a career change and started a non-profit, college preparatory program, Youth Enrichment Series, Inc. (YESICAN), for children in her hometown. 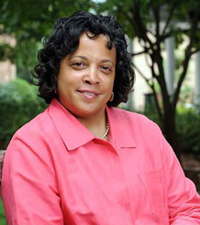 From there, she began consulting in the field of college access and for the past five years has served the Alamance-Burlington School System in North Carolina as Founder and Executive Director of The "What's After High School?" Program. The book, Within View, Within Reach is the first in a series that brings together the proven advice and instructions Hadley has provided to teenagers and parents over the years resulting in college admissions, undergraduate and graduate degrees, financial aid and scholarship dollars, successful interviews, travel abroad opportunities, internships in the US and abroad and finally jobs! Robyn spoke at a Morehead-Cain Alumni Forum about the importance of middle school in the college preparation process. Click here to see this speech. To arrange for Robyn to speak at your school, church, group or at an event please contact Toya Corbett at toyacorbett@gmail.com or (410) 913-7588.